Until the middle of the 20th century the Earth's magnetism seemed to be a happy accident of nature. Too many factors had to fit just right--the fluid core of the Earth, its electrical condctivity and its motions, all had to satisfy the strict requirements of dynamo theory. That was before other planets in the solar system were visited and examined. Now we know that among those planets, only Venus lacks any magnetism. The planets differ greatly in size and properties, and their fields differ too. Yet they all seem to have dynamo fields, or (in the case of Mars and the Moon) have had them in the past. In early 1955, two young radio-astronomers started working with a cross-shaped antenna array of the Carnegie Institution's Department of Terrestrial Magnetism (DTM). The array stood on the north shore of the Potomac River (upstream from Washington, DC and slightly south of White's Ferry; more here) and could select signals from a narrow range of directions. Ken Franklin and Bernie Burke calibrated it using a known source, the Crab Nebula, then began surveying the surrounding sky. They detected another conspicuous radio source, but unlike the Crab, its position slowly shifted. What was it? Standing next to the array at night, Bernie noted a star overhead and asked Ken "what is that bright thing up there?" It was Jupiter, and that's where the signal came from. In publishing their result, the astronomers speculated "the cause of this radiation is not known but is likely to be due to electrical disturbances in Jupiter's atmosphere." The discovery is now commemorated by a historical marker at the site (image on the left). In 1959, after the Earth's radiation belt had been discovered, Frank Drake observed Jupiter and concluded from the relative intensities in a range of wavelengths that the signal was probably emitted by electrons trapped in a strong magnetic field. Then in 1973 the space probe Pioneer 10 passed by Jupiter and found there, sure enough, an enormous planetary magnetic field and a very intense radiation belt. If the fields of Earth and Jupiter were both approximately represented by bar magnets at the planet's center, then Jupiter's magnet would be about 20,000 times stronger. Jupiter's magnetic axis, like the Earth, is slightly offset from the rotation axis, but while Jupiter and Earth (and other planets) spin in the same sense, the magnetic polarity of Jupiter is the opposite of Earth's. What produces that field is still unclear. No one knows what Jupiter's core consists of, but by one widely held theory, it is hydrogen, compressed by the huge weight of the planet's outer layers to the point at which it becomes a metal and conducts electricity. The strange radio signals observed by Franklin and Burke came from Jupiter's radiation belt, the most intense one in the solar system--so intense that after just one pass through it, Pioneer 10 suffered some (minor) radiation damage. Along with its radiation belt, Jupiter also has auroras, observed from Earth by the orbiting Hubble telescope. Jupiter's magnetic field produces some interesting interactions with the planet's larger moons (which are bigger than ours). Io, the innermost large moon, is heated by its tides, a bizzare world with active sulphur volcanoes and a thin atmosphere. Its ionosphere and/or body conduct electricity, and the relative motion between Io and Jupiter's magnetosphere creates a dynamo circuit, which produces large currents flowing between them. The space probe Voyager 1 passed close to those currents on March 5, 1979, and observed their magnetic fields. 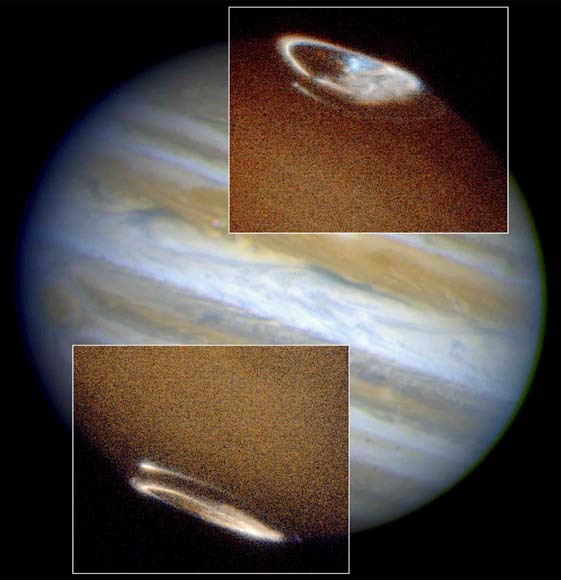 Those fields also affect Jupiter's radio emissions and cause the "signal" which they beam to Earth to rise and fall, depending on the position of Io. More recent observations by the Galileo space probe also suggest that the moon Ganymede has its own magnetic field. Jupiter's magnetosphere at these distances rotates with the planet, and as it moves past Ganymede, that moon apparently carves out it it its own small magnetosphere. All four giant planets--Jupiter, Saturn, Uranus and Neptune--were visited by Voyager 2. (The first two were also visited by Pioneer 10 and 11 and by Voyager 1, and the probe Ulysses flew by Jupiter, while the probe Galileo is currently in orbit around it.) All four have magnetic fields much stronger than the Earth's, in the sense defined above for Jupiter. Saturn's magnetic axis, remarkably, seems to be exactly lined up with its rotation axis, within the accuracy of observations. The magnetic axes of Uranus and Neptune, on the other hand, are inclined by about 60° to their rotation axes. The shape and properties of a planetary magnetosphere depends on the angle between the flow of the solar wind (i.e. the direction from the Sun) and the magnetic axis, and for those two planets, that angle is rapidly changing all the time. As a result, their magnetospheres undergo wild variations during each rotation, although both manage to contain trapped particles. The origin of all those field is unknown: Saturn is big enough to produce metallic hydrogen in its core, but Uranus and Neptune are not. 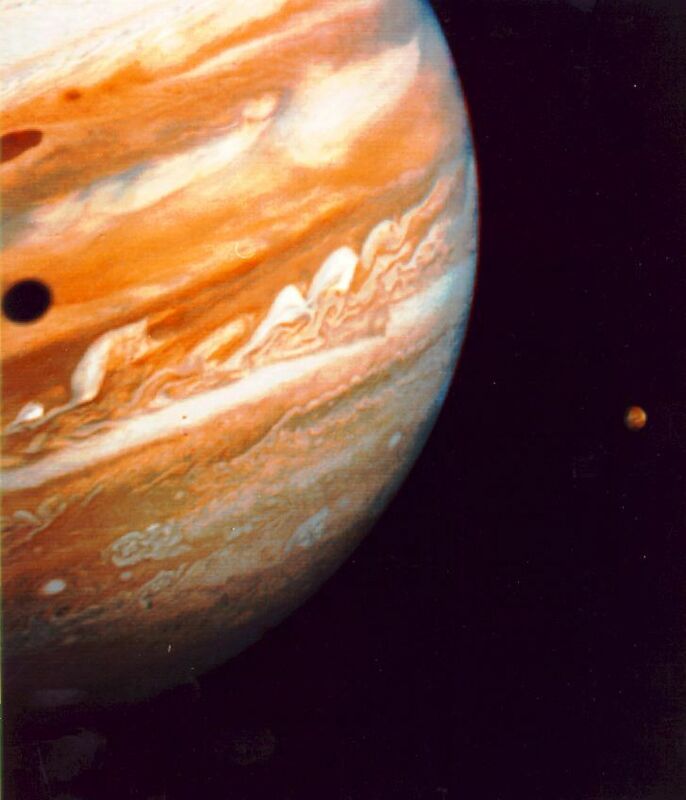 The planet Venus was visited by Mariner 10 in 1974, which continued from there to Mercury. Venus was found to be unmagnetized: the solar wind is only stopped by its upper atmosphere, the ionosphere, creating a completely different type of magnetosphere, more like a comet's tail. On the other hand, tiny Mercury--an airless rock only moderately bigger than our Moon, rotating very slowly--surprised observers by being magnetized. Its magnetic field is weak and probably does not extend far enough to trap many particles, but as the spacecraft passed through its nightside tail, it observed a sudden spasm in which particles were apparently energized. To learn more about all this, NASA has scheduled the "Messenger" mission to fly to Mercury and orbit it. Mercury may actually have a molten core, and thus perhaps its field may be due to a dynamo effect, like Earth's. Mercury is slightly deformed like the Earth's Moon, but whereas our Moon's rotation period equals its orbital period, Mercury is locked into a more complex pattern--3 rotations each 2 orbits. Because Mercury's orbit is slightly elliptical, it also undergoes librations, causing the Sun to pull its elongated part. The librations differ whether the core is molten or not--if it is, the Sun's periodic pull is not transmitted so well to it and it rotates more smoothly. According to an article by Jean-Luc Margot et al., Science 316 , p. 710, 2007 (reported by Johanna Miller in "Physics Today", July 2007, p. 22-4), this seems to be the case "with 90-95% certainty." The Messenger mission is expected to make the case more definite. Mars and the Moon have permanently magnetized patches of rock on their surfaces, suggesting that even if they now lack a dynamo field, at some time in the past they possessed one. That would agree with the giant volcanoes (apparently extinct) observed on Mars, which suggest a hot interior. The magnetized patches on that planet, first observed by the Mars Global Surveyor, are particularly intriguing because they seem to form strips, reminding researchers of the magnetized strips observed on the sea bottom on Earth, from which the idea of plate tectonics emerged. 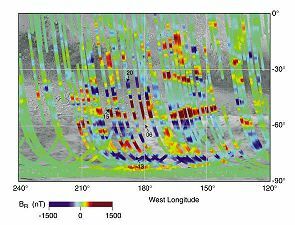 Magnetic observations on Mars, however, are not yet detailed enough to allow any firm conclusions to be drawn. Planetary magnetic fields thus seem to be the rule, not the exception, at least in our solar system. About a thousand years have passed since the discovery of the magnetic compass gave the first hint of such fields. As their study enters its second millennium, it faces more unanswered questions than ever before. Questions from Users: What would a Compass on the Moon point to? *** Does our magnetic field stop the atmosphere from getting blown away?